Chief Executive Leung Chun-ying’s invitation to the public to contribute their views to his preparation for the upcoming policy address is a wonderful opportunity to suggest ways to make Hong Kong more liveable. Climate change is a pressing global challenge. At the UN climate summit in Paris , 20 countries including China and the US launched the Mission Innovation  initiative with a collective commitment of US$20 billion to accelerate global clean energy innovation. So how much will the Leung administration commit to the climate challenge? Vegetation targets. Hong Kong is fortunate to have a natural carbon sink in our country parks, as long as we don’t allow housing development to encroach on them. We should set targets for vegetation coverage in the country parks and throughout the city. Des Voeux Road Central. To improve air quality, congested Des Voeux Road Central should be turned into a vehicle-free zone , with water features to mitigate the concrete-jungle feel. This would persuade people to walk or take public transport, which is good for public health. Leung should learn from the South Korean government, which removed an elevated highway in Seoul’s city centre to revitalise the Cheonggyecheon stream, now an urban park. Food waste. More than 3,600 tonnes of food waste is created daily in Hong Kong. Although our government plans to build three organic waste treatment facilities between 2016 and 2021, the total daily capacity they can handle is only 800 tonnes, or 22 per cent of our food waste. Hong Kong still does not have a waste charging law. If food waste recycling was made mandatory, all private food waste recyclers would operate round the clock to help achieve the government target of reducing food waste disposal at landfills by 40 per cent by 2022. Energy efficiency. Publicising the energy utilisation index of all buildings would be a cost-effective way to encourage these buildings, through peer pressure, to improve their energy efficiency. Currently, the law requires only commercial buildings to declare their index, whereas government buildings are exempted. Energy savings. There should be a government-led programme for generating “negawatts” – energy saved instead of consumed, which is the cleanest energy of all. If Hong Kong’s 7 million residents each generate just one “negawatt” a day, Hong Kong would save 1.7 million tonnes of carbon dioxide a year. The question is, will Leung take the lead and implement these suggestions? Ed Miliband has called on the UK to become the first country in the world to enshrine in law a target of reducing carbon emissions to zero. The former Labour leader and energy secretary said Britain should show leadership and send a clear signal to businesses by building on its existing target of cutting emissions by 80% by 2050 under the Climate Change Act. The intervention, in a comment article for the Guardian, comes a week before world leaders including David Cameron and Barack Obama meet for a landmark climate change summit in Paris. Nearly 200 countries are due to attend the negotiations to thrash out a deal for emissions cuts beyond 2020 and financing for poorer countries to cope with global warming. “When we did the Climate Change Act [in 2008] it did send a message around the world, and then people did follow. It was Britain saying we’re going to do these big reductions and put it in law. I think there is the prospect of that happening again,” Miliband said. The Labour MP said he did not want to put a date on when the zero emissions target should be achieved, because that decision should be taken by the government’s statutory advisers. To avoid dangerous global warming, the UN’s intergovernmental panel on climate change has said emissions must be cut to near zero by the end of the century. Nicholas Stern, the economist commissioned by the then chancellor Gordon Brown to assess the costs of inaction on climate change, said he supported a target of reducing emissions to zero but would not go so far as to say it should be written into law. This summer the government’s statutory climate advisers warned that the UK’s existing carbon budgets could be missed. The group’s chairman John Gummer took the unusual step of singling out Conservative policy changes such as scrapping a target for all new homes to be zero carbon. But Miliband said he was not interested in political point-scoring in his call for a zero emissions target, which he said was backed by Tory, Liberal Democrat, SNP and Green party MPs. “I’m not in the business of trying to have a go at the government. Paris is too important. I genuinely hope they will look upon this as a sensible cross-party initiative which they can support,” he said. French authorities have said the Paris summit will still go ahead despite the recent terror attacks, although authorities have forbidden a planned march that was expected to attract hundreds of thousands of people. Miliband, who attended the last major climate summit, in Copenhagen in 2009, said he was hopeful of a “decent” deal at Paris. Countries representing nearly 90% of emissions have put forward their climate pledges before the summit, but a UN analysis found they would still lead to temperature rises of 2.7-3C – more than the 2C limit to which leaders have agreed. The EU, China and the US, among others, have called for a five-yearly review mechanism to ratchet up those pledges to meet 2C. “It’s very important we embed that in the agreement,” Miliband said. He admitted that while the Copenhagen summit had been a setback in some senses, it had also laid some of the groundwork – such as a promise of $100bn a year in climate aid for poorer countries – for any deal agreed in Paris. The Paris conference opens on 30 November and runs until 11 December. BERLIN — Visit a state-of-the-art recycling plant on the outskirts of this historic city, and one cannot help but marvel at the ambition of the facility owner, the Alba Group, one of the 10 largest companies for recycling services and raw material supply worldwide. At its Hellersdorf operation, more than 100,000 tons of packaging waste is processed annually, with the centerpiece a fully automated and very busy system of conveyor belts that distribute and sort assorted refuse by means of infrared sensors, overbelt magnets, sieves and air-blown separators. The plant represents the best of German engineering and technological prowess. It was born out of a licensing fee system that has since 1990 turned the Germans into a nation of rubbish sorters, but the system, impressive as it may look, still has loopholes you can drive a garbage truck through. While glass and paper are recycled at rates approaching 100 percent waste retention, plastics, by contrast, barely top 50 percent. Moreover, what’s counted as “recycled” often means the plastics were incinerated. Experts say Germany doesn’t track materials that are rerouted somewhere else, as the French system does. As a result, German incineration plants’ appetites are huge. They import one-sixth of the required 16 million tons of garbage from the United Kingdom, where a high landfill tax drives waste out of the country. The country has 68 household waste incineration plants, which use district heating systems to pipe enough warmth for 3 million people. In addition, the facilities generate more than 6 billion kilowatt-hours of electricity flow from the facilities — enough for 2 million people. Every year, roughly 45 million tons of waste winds up in a category called “thermal recycling,” which has nearly doubled since 2004. Some blame that on misguided laws qualifying energy-efficient incinerators as part of the nation’s much-touted Energiewende, or energy revolution. As a consequence, both Alba and Remondis — the market leader for packaging waste recycling in Germany — have had to scale back operations, as reported by the Handelsblattnewspaper earlier this month. Of Remondis’ original 17 sorting facilities for plastics, it now runs only three in full-time service. Looking ahead, environmental campaigners in Europe say a better approach should not only be a focus on increased processing — as is the German model. Rather, it should include a shift toward waste prevention that sees closed-loop approaches emphasizing everything from longer-lasting product design to remanufacturing and reuse systems. “Resource politics in Germany tend to focus on ‘waste,’ and what we want to do is look at resources in the first place,” said Falko Leukhardt of the Council for Sustainable Development, a quasi-governmental organization that advises the German government and reports directly to the chancellor’s office. The discussion about achieving what is called a “circular economy” is slowly coming about in Germany, Leukhardt added, but in a piecemeal manner that lacks a unifying vision. Draft legislation being moved through the Environmental Ministry does, for example, extend producer responsibility laws to nonpackaging items like flower pots made of plastic, kitchen utensils and children’s toys. There is also a proposed system of licensing fees that will be graded according to environmental criteria. For example, it would reward easily recyclable mono plastics with a lower charge compared with heavier, composite plastics that are typically very expensive or even technologically impossible to separate. These measures will likely shift the market toward greater use of recycled plastics, though to what extent remains unclear. Much of the demand for recycled material has dropped due to a fall in the price of oil, a basic feedstock used to make plastics, according to the BDE Federation, a trade association representing Germany’s waste management industry. Meanwhile, gaps in German recycling laws have enabled waste haulers to take their plastics to be burned in highly inefficient and unregulated cement kilns. Germany’s road to this mess was paved with good intentions in a 2005 law that banned landfilling, explained Piotr Barczak, a waste policy officer at the European Environmental Bureau, a Brussels-based coalition of grass-roots environmental organizations from across the continent. While garbage incineration plants can be operated at relatively high levels of energy efficiency, they are, in effect, using energy to destroy resources. For every ton of waste burned in an incinerator, EEB estimates 20 percent of it will wind up as a hazardous ash that must be stored in a costly landfill. As the European Union ponders a landfill ban, environmentalists argue there should also be simultaneous restrictions on incineration. That position has now been adopted by the European Parliament, the body that, along with the European Commission, has joint responsibility for crafting legislation. Viewed as the more environmentally active of the European Union’s institutions, on July 9 it passed a far-reaching set of measures that, among other things, establishes binding 2030 targets that substantially increases recycling rates for municipal (70 percent) and packaging (80 percent) waste. The goal of the circular economy, then, is that products and materials should be kept at their highest utility and value at all times. Thus, plastic should remain plastic, and that incineration of nonrecyclable waste should be stopped after 2020. Incineration subsidies will also be cut alongside a pledge to gradually limit the landfilling of certain hazardous and residual waste streams. Across the European Union’s 28 member countries, only 40 percent of materials in the municipal solid waste system is currently recycled. Roughly 25 percent is recycled with energy recovery, and the rest goes to landfills. “This needs to change,” Frans Timmermans recently wrote in a blog post he co-authored with three colleagues from the European Commission, of which he is a first vice president. Led by Timmermans, the commission has opened a public consultation to collect views on a circular economy package that is said to be a more ambitious approach than one that was scrapped in late 2014. “Products should be designed to be durable, shared, re-used, repaired and recycled,” wrote Timmermans, citing a report by the Ellen MacArthur Foundation, a British group that gives startling numbers on so-called planned obsolescence — the practice of designing products with a purposefully limited life span so that they need to be replaced sooner. The “useful” life of physical products averages out to only four years, say the report authors, after which only 40 percent of all materials is reused or recycled, at only 3 percent of its original value. “Even materials such as plastic bottles, steel, paper, deemed to be recycling success stories, experience as much as 75 percent loss of their value from the first time they are used,” Timmermans added. What might a circular economy look like in practice? Already the European Union has an eco-design directive that requires products to be more durable, repairable and recyclable. So far it only addresses energy-related white goods like washing machines and refrigerators. Advocates want to extend the provisions to provide product passports so that consumers have information on recyclable materials and repairability. If the initiative succeeds, perhaps it might resemble a French law enacted in March that legislates against planned obsolescence. Moving forward, all French appliance manufacturers are required to inform vendors how long spare parts for a given product will be produced. Vendors are then required to inform buyers in writing, and failure to do so can result in up to €15,000 ($16,800) in fines. France reportedly has plans to enact an additional measure next year that will require manufacturers to replace or repair faulty appliances free of charge for the first two years after they’ve been purchased — basically a mandatory warranty. As for incineration, the discussion playing out in the Netherlands has already seen major generators like the Amsterdam Waste-to-Energy Co. begin to phase out the two oldest of its three incinerators in the medium term. It’s starting to invest in open networks — essentially smart grids for heat — to which other energy sources such as geothermal energy, biomass or generator-produced heat can also be connected, noted Nicole van Buren, project leader at the Council for the Environment and Infrastructure, an advisory board for the Dutch government on matters of sustainability. In the short term, a more immediate solution resides in simply viewing waste as a resource to be traded across borders, just like any other commodity. One could thereby help E.U. member states close down their landfills and simultaneously build up a recycling structure, said Leukhardt. In the United Kingdom, for example, a high landfill tax now drives much of the waste out to countries like Germany and the Netherlands. That policy decision — to move toward higher recycling targets — was made by British leaders and is now being facilitated, in part, by waste incineration capacity in mainland Europe. A similar arrangement could be established in Eastern European countries like Poland and the Czech Republic, where anti-incineration campaigners are pushing for more progressive recycling policy. I refer to the articles (“Green certification fees rise sharply”, April 27), (“Developers laugh all the way to the bank”, April 28), and (“Monitor green building scheme”, May 4). The building sector accounts for 90 per cent of electricity consumption and over 60 per cent of greenhouse gas emissions in Hong Kong. The Hong Kong Green Building Council was established to foster green building development and preserve the planet for future generations. One aspect of our work is to develop and manage BEAM Plus, a green building assessment and certification system tailor-made for Hong Kong. The Buildings Department’s policy of offering gross floor area (GFA) concessions existed long before BEAM Plus was launched. The GFA concession provides developers with the resources to incorporate green features in buildings, benefiting occupants and the environment. If, for example, a developer chooses to install solar hot water panels, it needs a larger tank to store hot water. Extra space is required, and the GFA concession encourages developers to incorporate such green features without decreasing the saleable area of the property. The government applied a cap of 10 per cent on the GFA concession in 2011, while adding BEAM Plus certification to the list of criteria that developers must satisfy to qualify for the concession. However, BEAM Plus certification is just one of a number of criteria. Developers were never granted a GFA concession simply by achieving certification. Some may think that incorporating green features in buildings should be mandatory, but this would obstruct the green building movement. Building designs take into account the surrounding environment and other variables, so decisions must be made on a project-by-project basis. It’s also important to remember that the green building industry is a fast-moving sector. New ideas constantly emerge, and BEAM Plus has the flexibility to adapt to rapid advances in technology and changing market needs, whereas mandatory regulations would not. The BEAM Plus registration fee is set fairly, according to project scale. It represents a very small portion of the construction cost. The fee is also used to fund the development of BEAM Plus, other research and development, and green building training, education and promotion. The Hong Kong Green Building Council is non-profit making and our income is invested back into the green building movement. I hope that we, with the government, the industry and the public, can continue to build a greener Hong Kong. Talk about setting the fox to guard the henhouse. Under the guise of urban and environmental improvement, developers have been able to win concessions of up to 10 per cent of gross floor area in their projects without paying a premium if they satisfy certain “green” requirements or merely claim to do so. And who certifies their green credentials? The BEAM Society, part of the Green Building Council, enjoys complete discretion and total unaccountability when it comes to certifying builders under its BEAM Plus assessment scheme. It gets worse. Many of the society’s directors have close business ties to the property and construction sectors. An internal probe, the results of which the society has refused to disclose, looked in 2013 into complaints about the lack of fairness, transparency and accountability in the way the scheme was administered. Since its inception in 2011, 260 development projects have been granted the exemption under the BEAM scheme. You can imagine how much money developers save – or premiums lost to the government coffers and therefore taxpayers – with those 10 per cent concessions. But what do developers do that is so great to deserve massive paybacks? Apparently, more efficient energy use, better site ventilation and indoor air quality, less water consumption and enhanced waste management. Shouldn’t developers be doing all those things already? Why do taxpayers have to subsidise them? But the scheme already represents some regulatory restraints. Before its introduction, developers could claim extra gross floor area without preset limits by adding amenities and green features. The Buildings Department and Development Bureau seem perfectly fine with the scheme. No doubt lucrative postretirement jobs await quite a few of their officials. The ICAC has recommended turning the assessment society into a statutory body to make it accountable. That is a start and would require drawing up a bill to pass through the legislature. It’s probably the best we could do in Hong Kong. A more sensible solution would be to make green standards mandatory. But given the developers’ lobbying power, there is a snowball chance in hell for that. The Green Building Council is cashing in on its right to accredit environmentally friendly building projects, having announced an increase in registration fees that will take them to double the level of two years ago. The not-for-profit body is responsible for certifying buildings that have undergone BEAM Plus assessment – governmentrecognised tests developments must undergo if developers are to claim green construction incentives. The assessment itself is carried out by BEAM Society (BSL), another not-for-profit group which developed BEAM Plus. Critics said the fee rise – for which the council has not offered any explanation – demonstrated the problems of leaving a government-recognised accreditation scheme in the hands of a private organisation that was not subject to public scrutiny. Council chairman Conrad Wong Tin-cheung said it was granted the right to use the BEAM Plus rating tool to develop related services under an agreement with BSL. BSL was one of four industry organisations that helped set up the council in 2009. However, a source familiar with the situation said the council had “nothing to do with the development, assessment and administration of the BEAM Plus scheme”, but forced BSL to grant it the right to “sign” the certificates and thus pocket the registration fee. Registration fees for extra-large, mega and exceptional-scale projects will increase to HK$300,000, HK$400,000 and HK$600,000, respectively, from June – double what they were in June 2013. The council also sets the assessment fees BSL can claim. 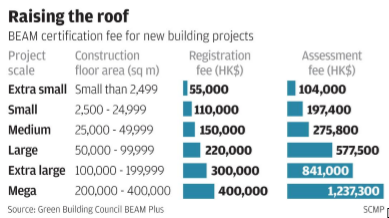 Assessment fees for new extra-large and mega-projects will rise by 25 per cent and 35 per cent, respectively, from June, to HK$841,000 and HK$1,237,300. The fees have proved lucrative for both organisations since the Buildings Department officially recognised BEAM Plus assessment as the accreditation scheme for its incentive programme in April 2011. The council’s financial statements for 2013 show its registration fee income more than doubled to HK$9.88 million that year, from HK$4.38 million in 2012. BSL also saw its turnover surge, from HK$7.45 million in 2012 to HK$13.2 million in 2013. The council says on its website that it reserves the right to adjust both certification and assessment fees, but did not detail the reasons for the latest increase. Founded in 1996 by construction and real estate professionals, BSL developed BEAM assessment tools for benchmarking green buildings. However, insiders say things have become complicated after BSL restructured itself to join hands with three other organisations, including the Construction Industry Council, to establish the Green Building Council in 2009. The government’s decision to officially recognise BEAM plus accreditation has increased the thirst for power and personal gain of some inside the organisations, a source said. Democratic Party lawmaker Wu Chi-wai urged the government to take steps to plug potential loopholes by either placing both bodies under its scrutiny or overhauling the whole incentive scheme. BEAM Society (BSL), which runs the BEAM Plus assessment scheme, has monopoly to carry out assessments that are required to obtain lucrative concessions Leaked documents have revealed conflict-of-interest allegations involving directors of a not-for-profit organisation with a monopoly on green building assessments that allow developers to claim government incentives worth billions of dollars. The allegations centre on the BEAM Society (BSL), which runs the BEAM Plus assessment scheme. Since 2011, registering for the BEAM Plus scheme has been a prerequisite for developers wishing to increase the gross floor area of projects by 10 per cent without paying the government any extra premium under a Buildings Department plan to encourage green development. But many of BSL’s 25 directors are drawn from companies in the construction and property sector, and BSL staff members have alleged that directors approved plans or project submissions in which they had a vested interest. The case sparked alarm given the public interest involved. One lawmaker was “aghast” that a private organisation with no government oversight was handed such a monopoly. In a letter dated May 16, 2013, a copy of which was seen by the South China Morning Post, BSL’s secretariat complains of a lack of fairness, transparency and accountability in the operation of the BEAM Plus assessment scheme, and says some directors abused their power. “Their roles have allowed them to gain enormous power with BSL, ie, sometimes they report to themselves for actions they take and could approve the plans that they themselves propose,” reads the letter to BSL’s board. It is signed by the secretariat’s administrative team, marketing and training team, and technical team. A source familiar with the situation told the Post some directors were indeed “more equal” than others. BSL chairman Professor John Ng Cheuk-yee said the board had investigated the complaint but “due to confidentiality of the board’s decision and the involvement of some persons, it would not be appropriate to divulge further information”. But he confirmed that not all of the follow-up actions recommended by the investigation team, which completed its work in October 2013, had been implemented. Three of the complainants no longer worked for BSL, he added. Founded in 1996 by construction and real estate professionals, BSL was set up to create the BEAM – Building Environmental Assessment Method – tool. The organisation underwent a restructure in 2009 when it joined three other professional organisations to set up the Green Building Council. The council is now responsible for certifying that developments are registered and have undergone BEAM assessment by BSL, and sets fees for registration and assessment. Ng said BSL began the process last year of converting itself into a public body under the Prevention of Bribery Ordinance. It had been advised to do so by the Independent Commission Against Corruption in September 2012. Doing so would require a government bill to pass through the Legislative Council. But critics say the government should have ensured it had oversight of BSL or the council before the Buildings Department gave the organisations a monopoly on assessments. The Buildings Department took a month to respond to requests for comment, then said only that it was not “involved in the management and operation of the [Green Buildings Council], BSL or the BEAM Plus assessment that they administer”. The BEAM Plus tests assess a project in several areas including energy use, site ventilation, indoor air quality, water consumption and waste management. Projects are given a grade on a five-point scale, but even those given the lowest grade, unclassified, are eligible for the gross floor area incentives – developers need only publish the results of the assessment in their brochures. Ng insisted some of the allegations were unfounded, including claims of inconsistency in assessments and of undue influence by some directors on the secretariat staff. The green requirement was introduced as part of a drive to halt widespread misuse of a scheme that allowed developers to increase gross floor area by adding extra amenities to their developments. Previously, the amount of extra gross floor area developers could claim for amenities and green features had not been capped. From April 2011 to December 31 last year, a total of 260 new projects had been granted gross floor area concessions, Buildings Department figures show. The Green Building Council has also been accused of pushing up the price of BEAM Plus certification – which critics again said reflected lax oversight. We are advised that in order to better meet a 2007 agreement in combating “global warming”, our government is to implement further measures to reduce energy consumption. I am all for reducing the waste in the use of energy – a laudable if futile aim, particularly if it is being done in order to reduce global warming – and reduction in pollution. However, please refrain from telling us that the essential trace gas carbon dioxide is a pollutant. It is amazing that our government maintains, strengthens even, its agenda in relation to global warming when there has been no global warming at all for the last 18 years and counting. Even the Intergovernmental Panel on Climate Change acknowledges that. After a five-year effort, Unilever tells me that it has achieved zero waste in all of its 240 factories in 67 countries worldwide. It says that it generates efficiency savings of €200m a year by eliminating disposal costs. Smaller businesses like restaurants have aimed for zero wastage, but Unilever – which makes PG Tips and Ben & Jerry’s ice cream – says it’s the first global company to do so. It’s a fairly remarkable claim and achievement since undoubtedly landfill waste has a huge environmental cost. The UK government estimates that households in England alone generate 177 million tonnes of waste each year. So, if it’s good for business and the environment, then why hadn’t Unilever and other businesses done this before? I put that question to Pier Luigi Sigismondi who heads Unilever’s supply chain. He said that the ethos around sustainability has shifted sufficiently to get one of the world’s biggest companies to launch this initiative. Remember that Unilever has had problems with environmental groups; for instance, as the biggest buyer of palm oil. Environmental groups have been concerned with the rate of deforestation in places such as Indonesia due to palm oil extraction. So, the stakeholder pressures appear to be there. When I asked if up-front capital costs are what puts businesses off, because most are geared for shorter-term returns, Mr Sigismondi pointed out that this was also changing as the biggest companies increasingly recognise the need to address sustainability. t’s an issue that came up when we discussed Fridgeonomics on Talking Business this week. As part of A Richer World season, we peered into people’s fridges to see how consumption patterns are changing with incomes. Refrigerators also contribute to global warming and the rate of refrigeration use is growing rapidly in the emerging world. So, we discussed technologies that use solar power, and other innovations that try to reduce the environmental impact and also allow more of the developing world to have refrigerators even in places with patchy electricity. Indeed, even with electrification challenges, owning a fridge is a mark of becoming middle class. The top three wish list items for a household emerging from poverty are a TV, a mobile phone and a fridge. When China reached middle income status a decade ago, about a quarter of the population had fridges. Now, it’s about 90%, just shy of the 99% rate found in developed countries. In India, which still hasn’t reached $3,000 per capita income, fridge ownership is about 27% and growing as the middle class expands. Of course, rising incomes generate a growing demand for food, and a richer variety including meat. Global food production will need to increase by at least 60% to meet this demand by 2050 when the global population is expected to grow by two billion to nine billion. That poses sustainability challenges too. Peering inside fridges around the world, it turns out that basic items, such as milk, comprised about 10 items. According to research by AllianceBernstein, for middle class households, there were more indulgent items such as ice cream. For the affluent, their fridges were stocked with healthier foods such as low-fat yogurt. So, as more of the world becomes richer, the challenges around sustainability will also increase. If, as it claims, Unilever has managed to make a business work with zero non-hazardous wastage, then that would a big step forward on an issue that will only gain in importance as the world gets richer.